AGST Module 1 (Environmental policy & Rural development studies) will hold a series of special lectures titled “Global Food Security Governance” from May 9 to June 2, 2017. 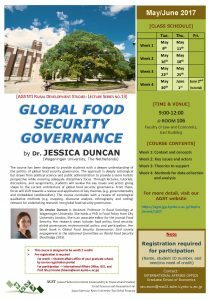 The course has been designed to provide students with a deeper understanding of the politics of global food security governance. The approach is deeply sociological but draws from political science and public administration to provide a more holistic perspective while ensuring adequate disciplinary focus. Through lectures, tutorials, discussions, and assignments, students will review the key issues and actors giving shape to the current architecture of global food security governance. From there, focus will shift towards a review and application of key theories (e.g. governmentality and embedded neoliberalism). The course concludes with a review of sociological qualitative methods (e.g. mapping, discourse analysis, ethnography and coding) relevant for undertaking research into global food security governance. Room 108, Faculty of Law and Faculty of Economics East Bldg. Click here to see syllabus.